Blog Is alien disclosure coming? There is plenty of evidence to suggest that non-human life exists but many people take this further. This includes trans-dimensional beings, angels, humanoids, and other beings that dwell amongst us, beneath us, and above us. Our ability to perceive outside of our current three dimensional measurable space is limited. So what would it matter if there was disclosure of aliens, human-alien partnership, or total confabulation? Whether or not there are aliens or not, we still have to work at keeping our lives in order. Since powerful aliens could destroy us, they obviously don’t want that. If they don’t want that, then perhaps the benefit is harnessing the energy of our free will towards “good and evil” is of some benefit to us and them. Instead of thinking that aliens would want to kill us, enslave us, or, trick us, perhaps we are just engineered to learn and grow until the day when we are suitable to be integrated into community of sentient beings either as individuals or as a species. 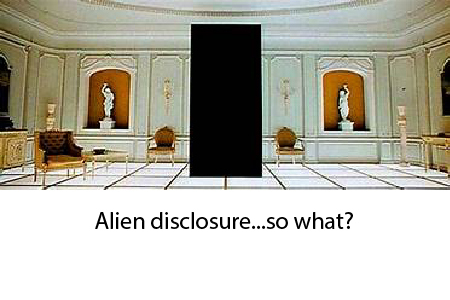 For those that research the idea of a government cover-ups, the argument has always been that alien disclosure would cause people to lose their religiosity, confidence, and general sanity. I’m not sure that was ever true but for the last 100 years, entertainment has shown us many versions of alien life forms interacting with humans. Do I believe in aliens? I really don’t know but the shenanigans in Antarctica and some of the crop circles make you wonder. If humans were just going to worship aliens like gods, then we would not be better off. But if we were to accept that we have uniqueness, agency, and allies, then perhaps we can confidently build a human condition that affirms our worthiness of not being ruled as chattel but instead protectors of liberty and truth.